Fed up with politics and a widening partisan divide? Frustrated by the lack of civility in public conversation? Feel like a spectator rather than a participant in politics? What has gone wrong? What should we do about it? 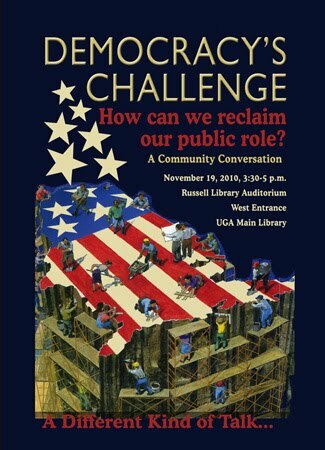 Democracy's Challenge: How can we reclaim our public role? When: November 19, 2010, 3:30-5:00 p.m. This forum will use the deliberative issue guide developed by the National Issues Forums Institute in association with the Kettering Foundation. If you are interested in learning more about the issue before the forum, you can watch a short overview video HERE. Russell Library (www.libs.uga.edu/russell) is located in the University of Georgia Main Library Building just off South Jackson Street in Athens, GA. Parking is available in the North Campus Parking Deck also on South Jackson St. Athens Transit and UGA Bus Service both serve the main library via the bus boarding zone on South Jackson Street.